Cool dude goes on holiday. 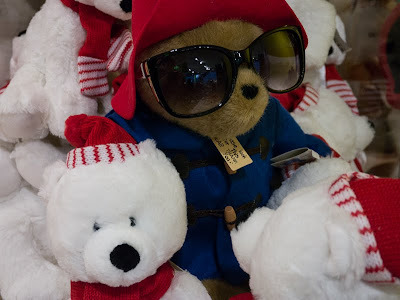 English bear was given gift of super cool sunnies. Snow or sun? What a dilemma. I'll leave you guessing where I've gone. That looks like Paddington Bear in those cool sunnies. Have a wonderful holiday! Merry Christmas and enjoy wherever your sunnies are taking you!